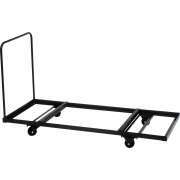 Tired of carrying folding tables around every time you have to set up an event? Hertz Furniture&apos;s table trucks will make your job a whole lot easier. A great dolly will speed up your setup and cleanup, and minimize the labor involved in the process. Rather than straining backs with heavy lifting, tables can simply be rolled into the right room. 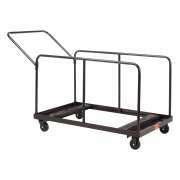 What kind of table cart should you get? 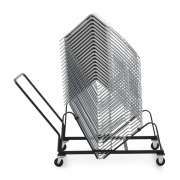 When you are purchasing folding tables, be sure to choose appropriately-sized carts. With Hertz Furniture&apos;s great selection, you can get table dollies which will accommodate virtually any shape or size. Does your church, company or school host many seminars or banquets? Do you feel like you are perpetually setting up and folding up tables? 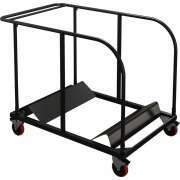 A table cart will make your life - and that of your custodian, maintenance workers, and other employees - much simpler. Instead of making multiple trips and carrying heavy furniture from room to room, you can simply load up your tables and roll them to the desired location. 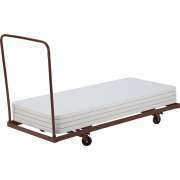 What are the benefits of a table cart? A folding table dolly saves both time and manpower. If you host big events, it will undoubtedly take many people a considerable amount of time to carry your tables into place and set them up. 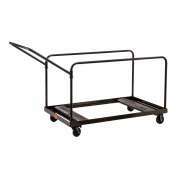 With the high capacity of our table carts, you only need one person to roll them into place and possibly a few others just for assistance with the setup process. 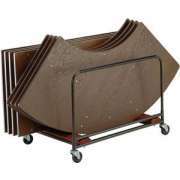 What is the best way to store folding tables? Table dollies help you obtain space-saving storage. Rather than stacking tables on the floor or against a wall, you can leave them in the table cart until you need them. This way, you don&apos;t have to worry about them toppling over or sliding down, or creating any special shelving for them. 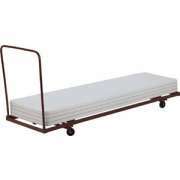 Table carts can even fit inconspicuously on the side of a room or behind a small curtained area. How do I choose a table dolly? Once you have determined that a folding table dolly is desired, it is important to make sure that you purchase the right one. 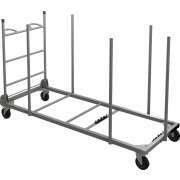 In order for them to be most steady, secure and efficient, table carts are designed for specific shapes and sizes. Because of this arrangement, you need to look at the specified size and shape of the table trucks you are considering. If you have tables in a few different configurations, you should look for a table mover that is capable of holding a number of sizes or shapes. Table carts either support your tables in a vertical or horizontal position. Rectangular tables can be carried either way, it just depends on the arrangement of the particular dolly model. The horizontal arrangement is easy for pushing because it keeps weight balanced evenly. 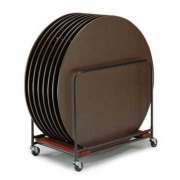 Circular tables must be transported vertically so they can fit through doorways. 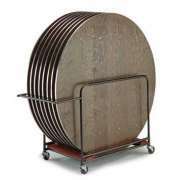 Table movers that are designed for circular tables ensure that they remain balanced so they won&apos;t tip or roll off of the cart. We even have units that are designed specifically for seminar tables. National Public Seating has a number of folding table dollies that are designed for your convenience. Two swivel casters and two non-swivel casters make it easier to get in and out of tight corners. Handles lock into position and tabs prevent the tables from sliding off of the dolly. 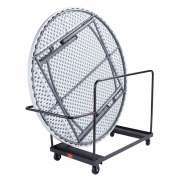 Round folding table carts from NPS have a beveled base so the radius of the circle sits inside of the dolly. For large round tables, there is even a special handle which ensures comfortable pushing. 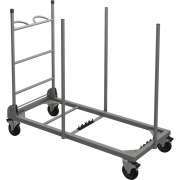 Are there carts that hold folding tables and chairs together? If you know you need to arrange tables and chairs together, we have dollies that support both. This user-friendly design keeps everything you need in one place. It has an incredible capacity of 42 chairs and 8 tables. With this arrangement, everything you need is ready to go right away when you need it. For the ultimate in strain and effort reduction, the Table Totter is the way to go. It transforms a laborious task into a simple one-person job. The innovative design eliminates all lifting and bending over. This cuts time and labor costs. Table legs are opened and locked into position, and then the tables can simply be tipped into place. 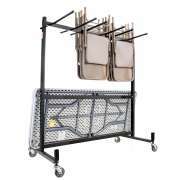 These table carts make it super easy to set up rows and keep tables in great condition. 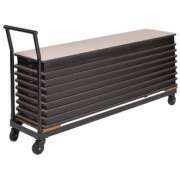 Hertz Furniture offers a number of time- and space-saving table carts that are convenient for any institution. We have folding table trucks from many reliable manufacturers including AmTab, Mayline, Bretford and National Public Seating. This convenient tool is a must-have in any setting that requires frequent rearranging.